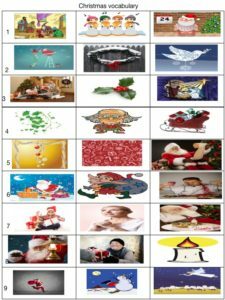 In this Christmas vocabulary exercise students match the Christmas related words and phrases to the pictures. The vocabulary can serve as an icebreaker or introduction into the religious, cultural and moral aspects of Christmas. Click on the image below or the link to download the PDF file. 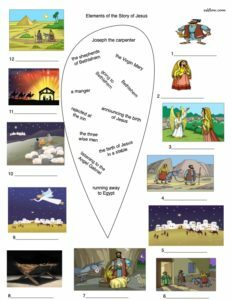 Using pictures is great way to present and illustrate the story of Jesus. And by getting students to match the pictures to vocabulary they will become more deeply engaged with the story. 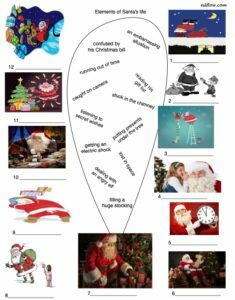 This is a Christmas discussion questions and speaking activity worksheet for English language learners. 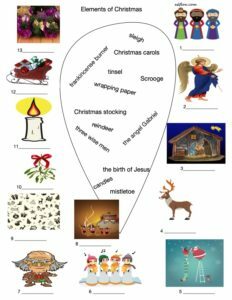 This is an activity for introducing or exploring Christmas related vocabulary with English language learners. It can used for dictating new language or it can be used as a game by giving students or teams points for finding the words that match the pictures. This is an elementary activity to get students talking about Christmas. 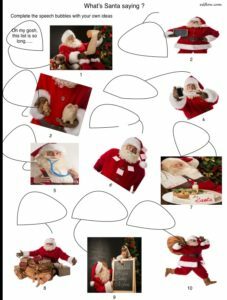 In this totally fun exercise students match the words and phrases to the appropriate pictures for a humorous look at Santa’s life. 7 What’s Santa saying ? In this Christmas vocabulary exercise students sort the Christmas related words into suitable categories.